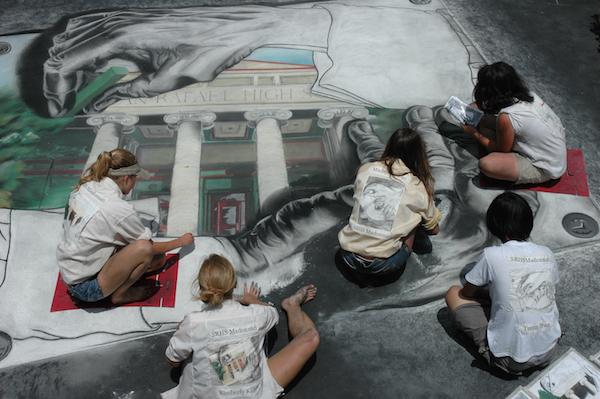 This intensive C Street Project workshop for teens in or entering high school will meet all day Wednesday-Sunday during the week of Italian Street Painting Marin, culminating in an original major piece at the festival. Students will learn classic street painting techniques and how to build a collaborative design for a large project. Italian Street Painting is a major downtown event in San Rafael. C Street Project students in this workshop will have their work seen by thousands! Space is extremely limited! Come into 617 C Street, Monday-Friday 11-4 to register in person. Youth in Arts strives to make art accessible to all youth. If you need a scholarship, please complete our scholarship application form here and staff will contact you.